Being the 2nd of June we are now in so called high season. But as I sit here under overcast skies eating my breakfast of cereal, minus the croissants I should also have had because I munched on them last night,(yes I am a piggy) it does not not feel like high season at all. It is rather cool and I know, I know because I keep being told. this is not normal but it is my reality, my here and now. Now I can only assume because this is not normal it goes some way to explain my many uncomfortable experiences in the showers. 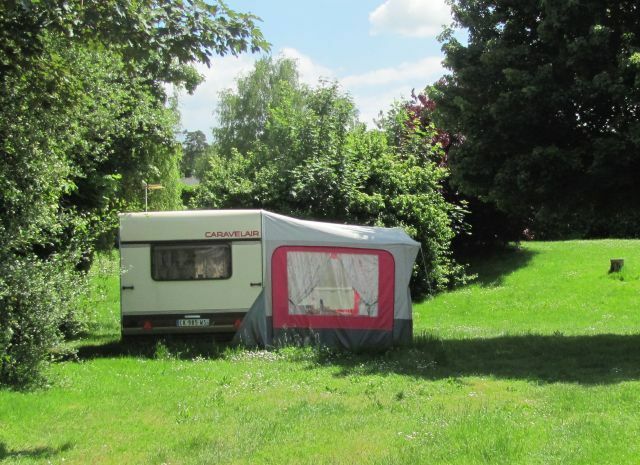 French campsites are simply not geared up for cold weather. I go to shower and the tiles are freezing cold on my bare feet. Burgh!! To make matters worse the water is tepid at best and the timer gives you a max of a 3 seconds burst. Oh this is bloody ridiculous. Another cold unsatisfactory shower to add to the list. Shame really because it is the only minus I have found on the wonderful Les Rioms campsite. I am sure if it was hot it would not have been so bad but still a 3 second burst is not good whatever the weather. Water conservation in the extreme maybe but with the current floods and rain I doubt France is short of water right now. The plan today after decamping is to head towards Angers. The roads are even quieter than usual this being a Sunday. We make sure we get to a supermarket before the 12:30pm Sunday closing time for supplies. As we travel along more straight roads I can not help but ruminate on the fact that we seem to have rushed too fast through the Southern and Alpine regions. Hindsight is no good but rather than persist in beating myself up about what now seems a wrong choice I decide to put my positive head on. One thing we can make out of this is to treat it as a learning experience. With no prior knowledge how we were to know before hand which regions were the best? Plus we were always trying to outrun the rain which kept us moving more than we would have if it had been dry. If we come back to France again we will now how a much clearer idea on how long it takes to travel around here and which regions we found the most appealing. We are doing everything right, nothing wrong, for we are living and we are learning something new everyday. We are gaining new knowledge about this place called France and about our own selves. What we like and don't like what are our strengths and weaknesses. We are travelling and we are travelling light and in a simple as way possible. It is freeing and I let this good feeling infuse my soul. 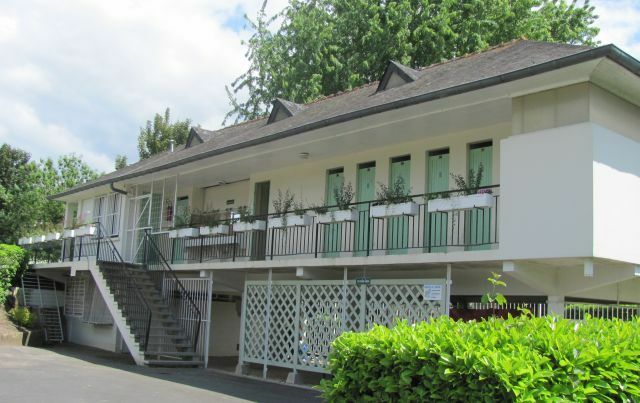 The site is set in an impressive location opposite the Chateau and along the banks of the river Vienne. For the price of €10 we can choose anywhere on the site we please. The site is basic but functional. The main shower block is modern but the other outside toilets are very basic but do contain plug sockets. Looks like some campers like it here so much they have decided to stay long term. After we pitch up it is actually warm enough for me to put a skirt on... Wow!! We take the short stroll across the bridge into the town. 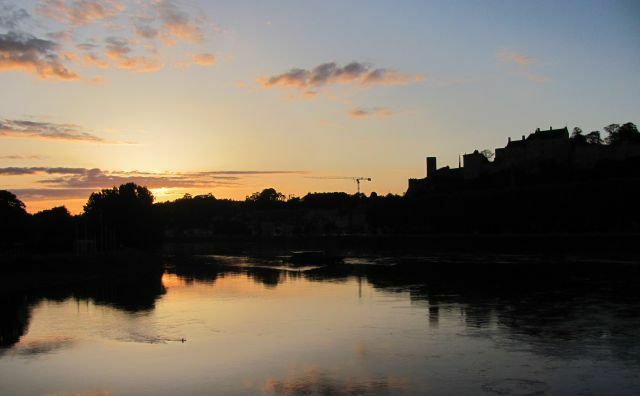 I find Chinon absolutely charming. Narrow cobbled streets twist and turn and are boarded by delightful old timbered buildings. Some of which date back to the 15th century and many have been very sympathetically restored. 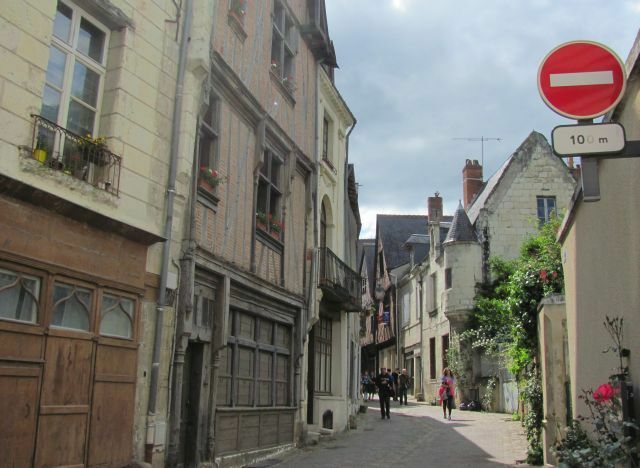 Old world timber houses make Chinon a delight. I am thoroughly enjoying the stroll and I am delighted by each new discovery. A small church with open doors and glowing stained glass windows lulls me temporarily inside. It is calm and serene in here but after a short reflection the rare sunshine pulls me back outside as more history awaits my discovery. More history comes in the form of Joan of Arc. 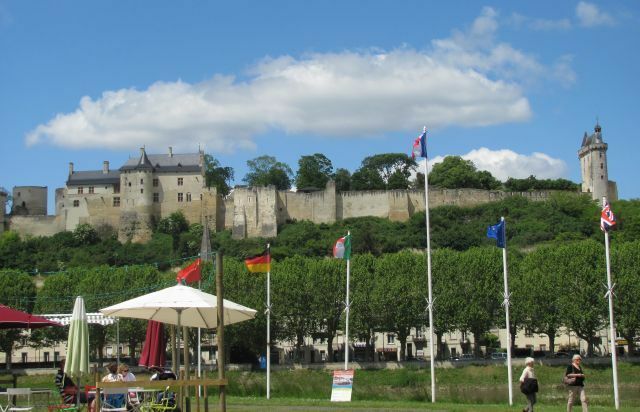 She came to Chinon in 1429 aged just 16 to meet with Charles VII. 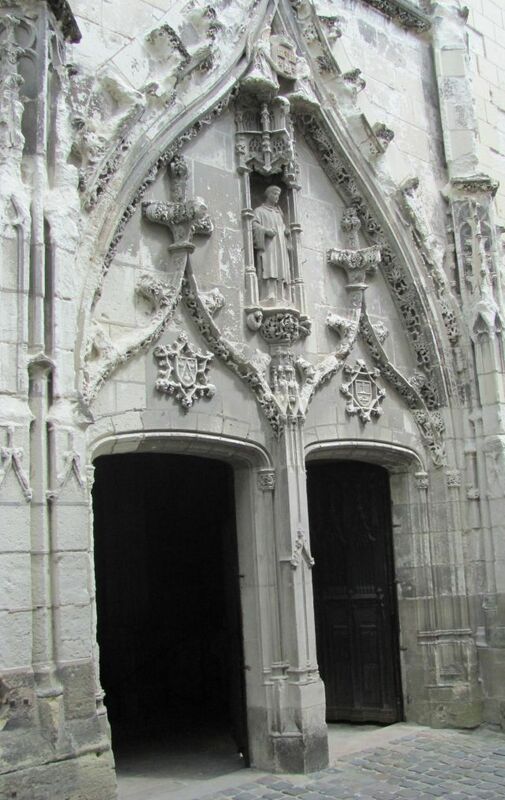 According to legend, to test if Joan of Arc was indeed guided by god the King disguised himself and hid among the Lords and Ladies in the hall. However on entering the hall Joan of Arc walked directly up the real King in his disguise. Charles and his panel of clerics declared that Joan had indeed heard the word of God. Charles VII gave Joan of Arc over 10,000 men over whom she would lead as their captain. 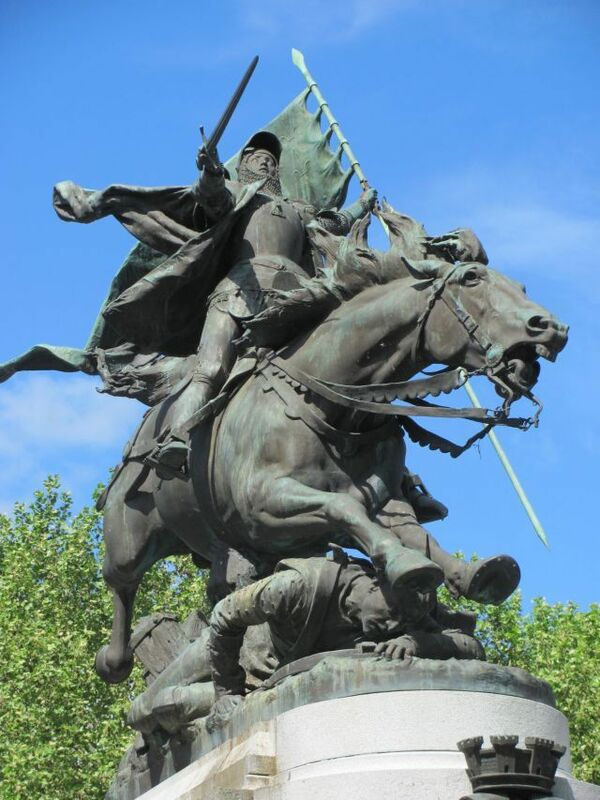 The impressive statue in Chinon of the formidable Joan of Arc. Although the sun was out the wind was a little chilly. However this did not prevent us from both enjoying a little ice cream each in the sunshine. After all the rain we had to pretend it was summer after all. It is so good to be walking around in a skirt and pumps with no heavy bike gear to weigh me down. So sprightly are we both feeling that we decide to have a go at walking to the chateau. As with most things they are further than you anticipate and it is all uphill. But we doggedly trudge on until we reach the entrance. Chateau de Chinon was originally built in the 11th century. It was in use until the 16th century but then fell into decay. 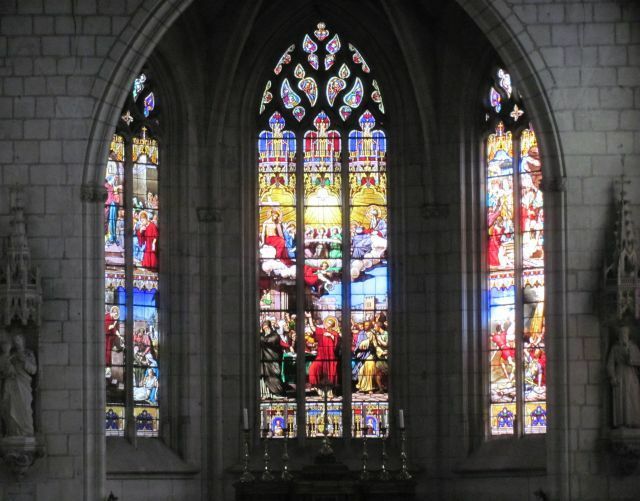 It was restored in the 21st century to its current state at a cost of 14.5 million euros. We discover there is a fee to pay if you want to enter and walk the ramparts, after all they have to recoup that rebuilding cost some how. After a brief discussion as to whether we should pay or not we decide we have probably walked enough. 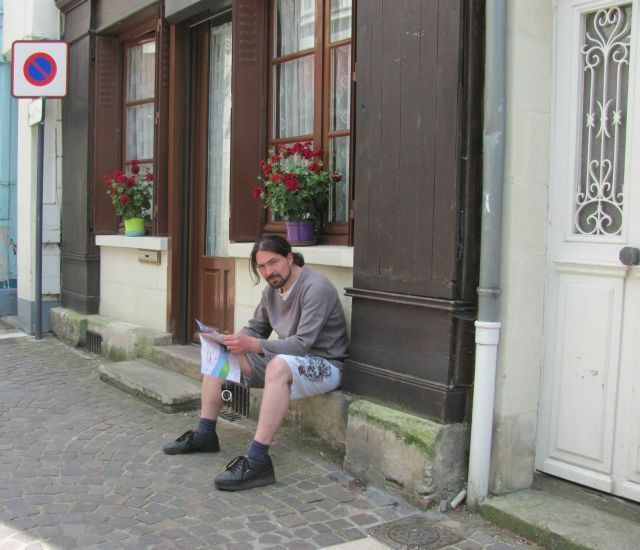 We glance at the menu of the cafe situated at the entrance of the chateau but its prices are well beyond our budget so we turn around to head back they way we have come. At least it will be down hill. I get a beep and a holler and a wave from a passing car which puts a smile on my face and spring in my step. After posing for a shot by the fountain I discover I have put most of my skirt actually into the water. Nothing like trailing water as I walk along to keep one looking glamours! As we reach the bridge we notice a curious sign to the left about an island. So we go to have a look. There is a large house at the beginning of the island but after that there is just a series of allotments set in woodland. 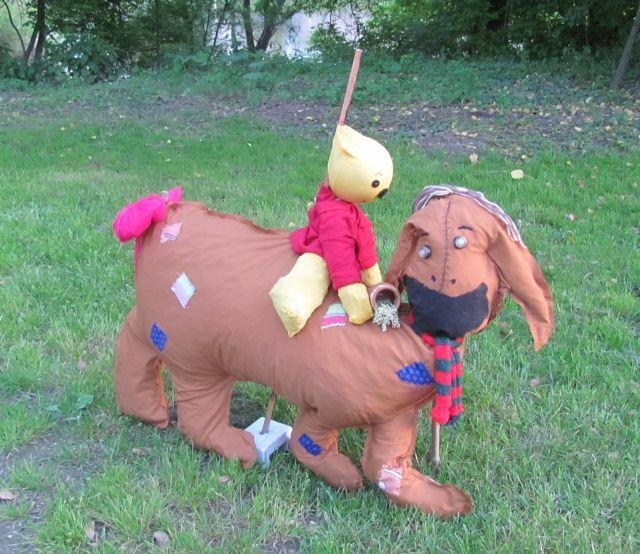 There is a scarecrow festival of some sort going on and there is some rather bizarre scarecrows on display. It is growing dark so once we have a good look around the tiny island we head back to the bridge. It has been good to relax. To stretch those muscles and be a real tourist for the day. Eating ice cream and admiring ancient buildings. I feel most content as I hold the bf's hand and gaze at the setting sun over the river. keep the travelogue coming, great reading.......I can just see the trail of wet floor behind you...........lol..............sorry.